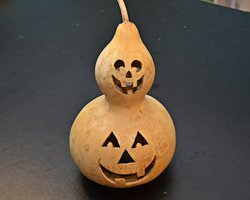 This is my first gourd craft I had tried, and I must say, I am hooked! It is amazing to me how these gourds become like wood when they dry. Since I love pumpkin carving, I suppose it is only natural for me to be drawn to gourd crafting. Last Fall, my family visited a pumpkin patch. They had freshly picked gourds for sale, for a couple bucks each, so I picked one up. I then began to read about gourds. There are plenty of books on this subject! There are three main families of gourds. First, there are the small ornamental types. Those are the cute colorful ones that look great in a centerpiece or placed in a bowl. The second type of gourds are the kind that have a loofah inside, the same ones you use in the shower. The third type of gourd is the kind you use for crafting. They are called the hard shell gourds (Lagenaria siceraria). When they are freshly picked, they are green and sometimes have stripes on them. When they dry, they become tan or brown. 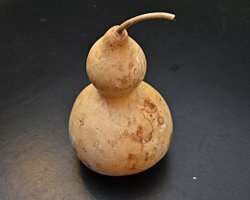 The hard shell gourds, when dry, will last thousands of years! Imagine! These are the types to make gourd crafts from. I must give a little forewarning that this is a time consuming project, because you must allow time for the gourd to dry. This may take up to six months! I let mine dry for one year. Once dry, they become light and the shell feels like wood. They can they be carved, painted, or wood burned. 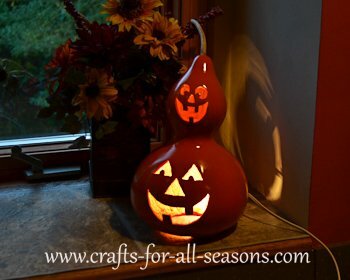 Read on to learn how I made this light up jack-o-lantern duo as my first gourd craft! 1. Drying the Gourds: My gourd was fresh, heavy, and green last year when I picked it up from the pumpkin patch. To dry it out, find a place outside. 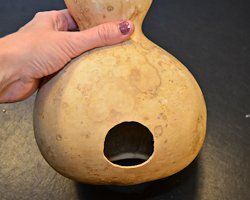 You want to do this outside because the gourd is actually going to begin to mold and you don't want that stuff inside your house. You also want an area with air circulation, so outside is the best choice. You could also dry these in an outdoor shed or garage. I was worried about animals, so I chose to hang my gourd. I did so by tying a rope around the neck and I hung this underneath our deck. You can also dry gourds somewhere on the ground without hanging, but you will want to have air circulation beneath them so they don't rot too much. For instance, you could put them on an oven rack propped up with some brick supports. If you want to learn more about drying gourds, just do a quick Google search. You will find loads of more information. Drying takes anywhere from six months up to a year. I let mine hang for one full year, until this Fall when I was ready to craft it. You will know it is dry when the shell is hard, the gourd is light, and you hear seeds jingling around inside! 2. 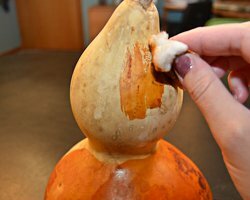 Cleaning Gourds: Cleaning the gourd takes some time and patience. Most likely your gourd will be pretty moldy and may have some dark spots on it. Get a bucket, large enough to hold your gourd. Fill it with hot water, and add a squirt of dishwashing detergent and a half a cup or so of bleach. Allow your gourd to soak in this solution for about an hour before you even try to do any scrubbing; it will make your life a lot easier! By the way, you'll have to find a way to keep the gourd submerged in that water, it will want to pop up since it is so light. I found something heavy and placed it over the bucket. Using a steel wool pad, scrub the skin of the gourd. As you do so, you will notice the first layer of waxy skin peeling off. This is a good thing, you want to remove that first layer. For stubborn spots, I found that using the back of a knife to scrape it off worked great. Take your time. If mold and the first layer of skin isn't coming off, change your soapy water and let it soak again. I really found letting the gourd soak for awhile makes the job a lot easier! Here's what my gourd looked like when I was done scrubbing. It still had some spots on it, as you can see. Allow your gourd to dry completely, preferably overnight. 3. 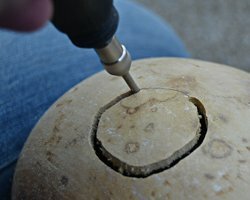 Cleaning the Inside: You need to put on some protective equipment to clean out and carve your gourd. This is because gourd dust is very hazardous. The dust contains mold spores and we don't want to inhale that. 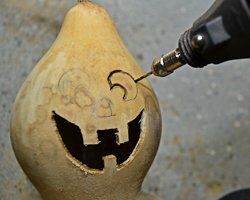 Clean and carve your gourd outside. Where a good quality dust mask and some eye protection. Many people use a mini jig-saw to cut and carve their gourd. I didn't have one. But I do have a Dremel tool, and boy do I love my Dremel. 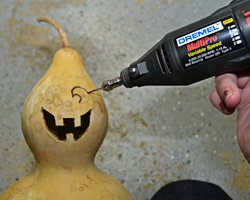 I used my tiny drill bit on my Dremel to carve regular pumpkins so I wanted to see how it would work on the gourd, and it worked great. The drill bit works to make the first hole and then you can make it cut by applying pressure to the drill bit, moving it in the direction of the cut, and applying an up and down see-saw motion as the same time. 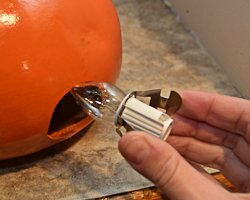 For your first cut, carve out a large hole in the bottom of the gourd. Remove the circle you just cut and get a bag ready to throw away the insides. You'll see the typical insides of a squash/pumpkin, but it will be all dried out, which makes it easier to remove. There will be seeds in there, and it will be dusty too. Make sure you have on that dust mask and eye protection, and it is a good idea to have on disposable gloves too. I was able to clean my gourd out by reaching it and pulling down all the woody threads with my gloved hand. For the top part of the gourd, the neck made it pretty tight to get up there with my hand. I used a pair of needle nose pliers to get the rest out, which worked great. I also read that gourd crafters often use a wire hanger that they have bent into a tool to get up in those tight spaces. Once all cleaned out, I chose to soak my gourd in a fresh mixture of soapy water/bleach solution again. This is to clean and kill off any mold that was up inside. Allow to dry overnight. 6. Now the fun part, decorating your gourd craft! What is so nice about gourds is their shape will help you determine what to make. The top of mine was so round I thought it would be cute to have two pumpkins on top of one another. I drew my pattern on with a pencil. 7. Using my Dremel with a small drill bit, I took my time and carved out my pattern (I did this outside with the proper safety equipment). 8. 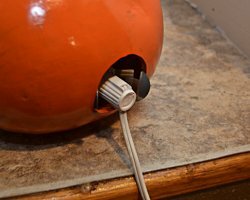 I also made a small hole in the back of the gourd craft for a night light bulb to fit into to. 9. 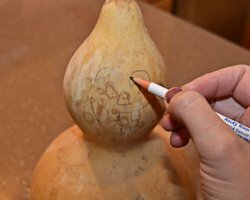 After I carved it, I went over the entire gourd craft with some light sand paper. 10. Next, I applied leather dye, which is very popular for gourd crafts. 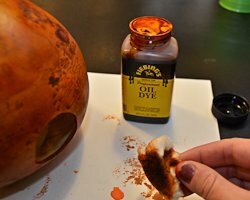 This dye is very easy to use, and it stains the gourd but still allows the natural markings to show through. I used a cotton ball and just dabbed it on. You could also paint your gourd with whatever paints you choose. After I did this however, I didn't like how the mold spots were still showing through. The dye will work really well if you want a natural look, but after I dyed it I ended up using an orange spray paint instead. 11. To give it a glossy finished look, I applied a polyurethane coat. 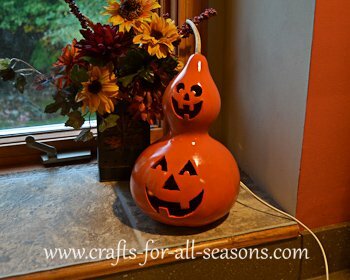 If you will display your gourd outside, Thompson water sealer works great. 12. You can add a night light bulb in the back to light it up!